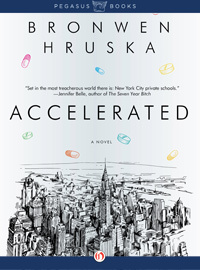 I’ve just finished reading Accelerated, a striking debut novel by Bronwen Hruska. She is a Manhattan Mom who writes about the over medication of children used as a platform to excel in academics. This debate, which she so cleverly brings to life, is really one over the use of Smart Drugs: Piracetam, Aniracetam, Desoxyn, Ritalin, and Adderall, all of which are FDA Classified Scheduled II Drugs (the same as Cocaine) and are intended to change brain chemistry with the effect of stealth-like focus. Confused, guilt-ridden, and afraid of the negative side-effects this powerful drug would have on her child’s brain chemistry she sought out other avenues to quell the disruptive behaviors. I met with her to discuss my Family Coaching Service, which is designed for students experiencing behavior challenges in and out of the classroom. 25% of the students I work with either in my Private Tutoring or Family Coaching practices are officially diagnosed with ADHD: some have been on and off various medications, some are not on any medication, some are taking holistic vitamins and seeking out alternative therapies, and some are doing great on medication. More and more, however, parents are relaying their concerns and are starting to question the schools, the doctors, and our society’s emphasis on medication in the classroom. The fact of the matter remains, however, that Adderall and Ritalin–two of the most common ADD and ADHD medications prescribed to young children– do their job very, very well: students are able to pay much better attention in class with these drugs. But at what cost? We all know that Lance Armstrong got busted for using performance enhancing drugs to win the Tour de France seven consecutive times. Let me play devil’s advocate with you for a second and ask: How is putting our children on brain-changing medication, brain steroids, any different? The lines are becoming a little blurry these days. Would that ‘A’ paper written by Christine, the student on 10mg of Adderall, actually be a ‘B’ paper if it were written by Christine, the student who was not on Adderall or any other medications? On the flip side, proponents of these prescriptions would argue that medical science has done us a favor, fixing a part of the brain that just wasn’t working quite right. Furthermore, there is always controversy when a successful medical path to improvement is found, such as the Cochlear Implant Debate, which is hotly contested amongst the deaf community as either a help or a hindrance. The Smart Drug Debate is, therefore, no different. Who is right and who is wrong is left up to the parents and their influencers. Of course there are exceptions to every rule but in general I’m fearful that our society is headed down a slippery slope, embracing a generation where The Advanced are in fact The Medicated.